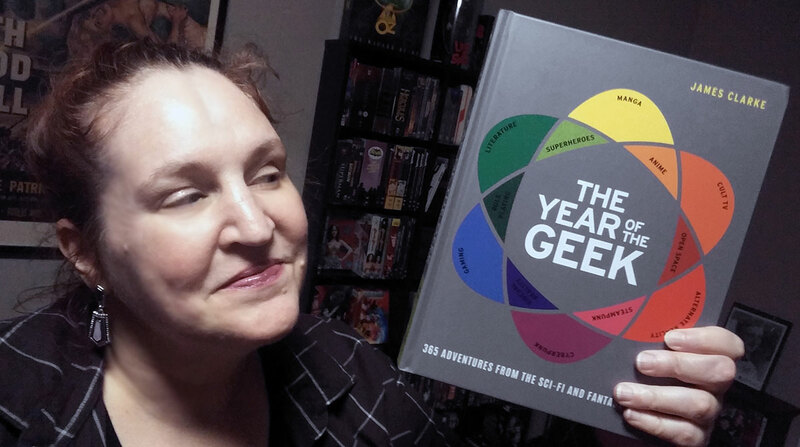 Part calendar, part encyclopedia, The Year of the Geek presents an infographic look at geek culture day-by-day. Geek culture, as demonstrated in this book, includes science, science fiction, television, comics, manga, anime, film and more. One day you’ll learn about Copernicus, on another Mr. Potato Head. From obvious geek favorites such as Star Wars and The Matrix to the more obscure such as Indian comic books and Legos, this books seems to cover it all. Each day of the year commemorates something in geek history — regardless of the type of geek. The infographic format is easy to peruse and visually engaging. There is an eclectic mix of geekness, so no matter how you geek, you’ll probably find something of interest in this book. I commend Clarke’s tenacity in finding something for all 365 days of the year. Too bad he didn’t come up with something for February 29! Some pages cram a lot of information into them. I would have liked to see a bit more white space to help separate the dates that don’t have associated infographics. In addition to a bit more spacious design, I’d love to see this book available in paperback. I also think it is a perfect vehicle for enhanced content, with links to multimedia content. Could an app be far behind? This is a fun book to peruse. I think it could give you hours of intellectually engaging fun. I plan to keep it on hand for reference, as well. I can see this being a go-to resource for trivia games and Toastmasters speeches.